... because of the things I do, the way I contribute. What we do and how we treat each other. It's ideas commanding positive change. That doesn't require a certain look. The mindset we bring to the table is we won't settle for "ugly" in our actions outward. It's time we stop looking at people as if how they appear somehow matters, really. Looks don't mean anything! Who a person is and what they do reflects more about their beauty. Does your presence put people at ease? Do you engage with others? 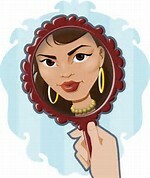 Does your beauty reflect back at you when you're on the right side of an issue? Are you there for people in any way you can be or however they need you to be? I want a different world which speaks a new language. Changing how we superficially view ourselves can be the start of it.